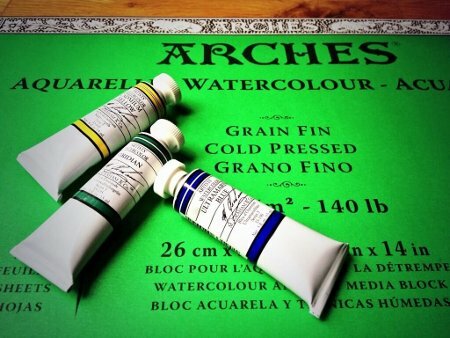 This watercolor materials list contains everything I paint with and use every time. I do not recommend throwing out all your old materials. I do recommend buying good materials in the future. 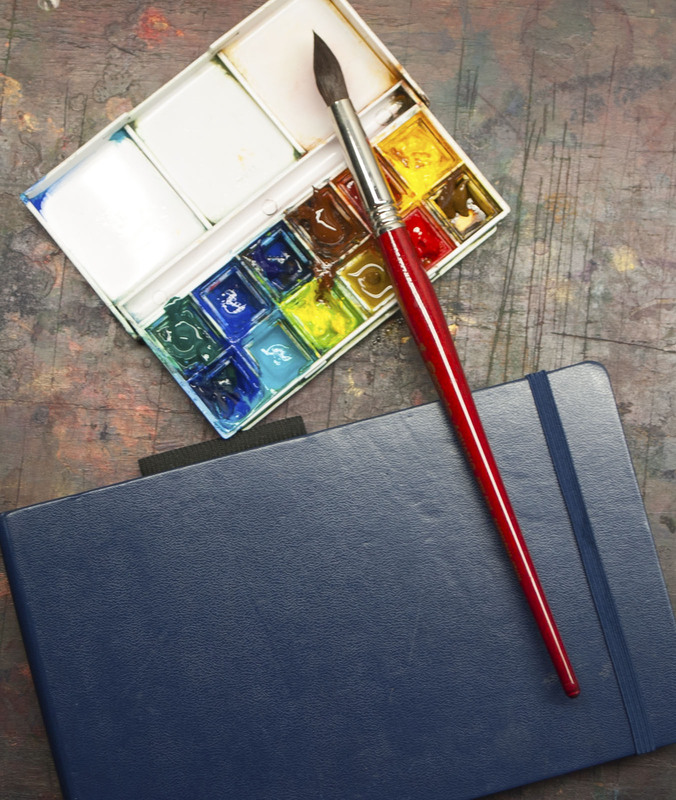 The most important material in watercolor painting is the paper. The next most important is a good brush. You can't paint good paintings with bad paper or flimsy brushes unless you really know what you're doing. If you're an excellent artist, then you can paint with anything. There is no magic wand to improve your painting. 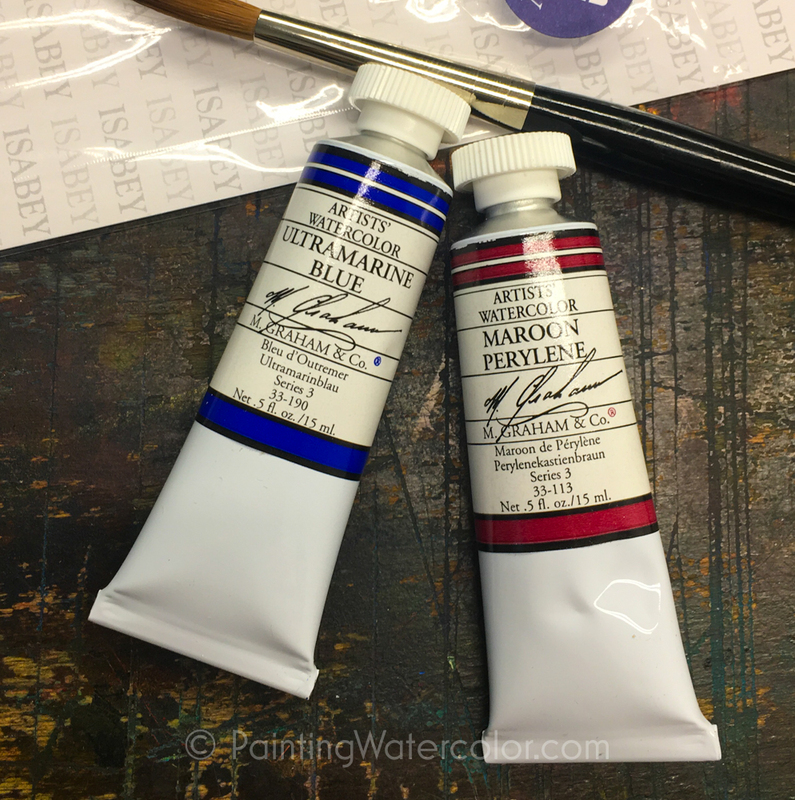 This painting materials lesson is about making learning to paint easier and fun! Good materials are part of that. Student grade paints are cheaper for a reason - they contain less pigment and a lot of filler (kaolin, glycerine, etc). So you actually end up paying more for student grade pigment than just getting artist grade paints in the first place. You might as well buy paints in the children's department as well as some student grades - it's the same thing and you'll pay a lot less. Also, to get rich bright colors, you need to go over the same area many more times with student grade paints. So it's almost impossible to prevent mud when you're using paints with a lot of filler (um...kaolin=clay=mud.) Please keep in mind that some so called artist grade paints are called that by their manufacturers not artists, so stick with reputable brands. Standards are improving, but aren't there yet. Don't forget that a lot of paint colors are proprietary mixes. So different colors may have the exact same name with different manufacturers. I tend to use colors that are as close to single pigments as possible for less mud. These are transparent watercolors, not gouache. Beautiful pigments mixed with honey. My favorite by far! Family company, made in the USA, fantastic quality! I use a Winsor and Newton Cotman palette for some plein aire work. I love their little palette and replace the marginal cake paints with M. Graham ones. I rarely paint finished paintings on location. I do sketches! Here is a video that shows my palette layout. It changes frequently, but the basic color layout is the same. Painting at home is very different from on location, so you need different papers. You need paper that is more disposable on location, since you'll be going through a lot more of it. 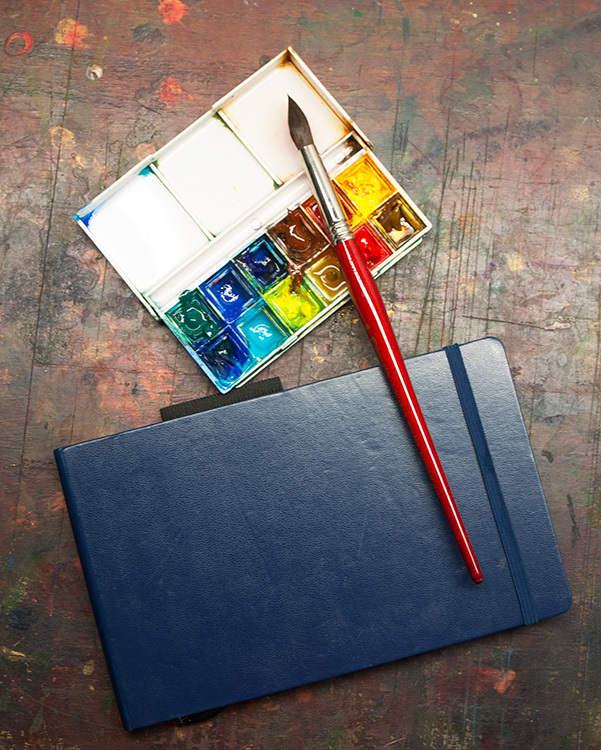 Prestretched blocks or a 140# watercolor journal are ideal for on location. In your studio, you have more paper stretching and drying time. Paper also is rarely going to blow away, so a few pieces of tape will keep a 140# paper stretched well enough to paint on. For detailed watercolor paper information, please go to my full tutorial about paper. The only basic guideline you really need is 100% cotton and 140# (300gsm) weight. From there, all paper will work. Let's talk about watercolor paper options for your studio first. Twinrocker paper (click for full review) is wonderful! It's handmade in the USA, has lovely feathered edges and just makes every painting start out a masterpiece! >Twinrocker paper has just the right balance of texture and slickness to really have paints glow. I've been using it for years and never fail to be impressed. Unfortunately, they don't send me free paper. The two negatives of Twinrocker paper is it's difficult to get the paper in the size you want. It's only sold through their website usually. It's also more expensive paper, since it's handmade. For more everyday painting - trying out a new technique, a difficult piece, etc. I'll use Arches (Click for full review) 140# cold, rough or hot press paper. Arches watercolor paper a solid workhorse paper. The sizing seems to vary per batch a bit, so be less aggressive until you know what the feel of your batch is. Lately I've been using a lot of Arches 140# blocks in rough texture. For a workshop situation, always bring at least 2 stretched sheets ( at least 8" x 10") a day. More is better. If you're learning (which is what workshops and sketching is about) then you should be whipping through paper. Blocks are good - no stretching. Always bring 2 blocks so one painting can dry while the other is started. Different teachers will recommend completely different materials and setups , but I've had students run out of paper trying new techniques which is just frustrating. I've had students show up with practically postage stamps to paint on and a #38 brush. Not going to work. Prestretched watercolor blocks are great for workshops. I like about 10" x 14", small enough to transport and finish several in a day. Not too devastating to start over. Use at least 140# paper. A lighter weight will be very difficult to work with. I use a variety of sketchbooks. This is a nice, 140# weight sketchbook I use. A Pencil / Charcoal Sketchbook is always useful for value sketches. Note on Paper Purchase: Several art stores use product stickers that leave residue on watercolor paper. You don't always know about it until you're well into the painting. Whenever possible, buy in groups of whatever the minimum is (usually 5) to avoid the sku sticker. Otherwise one side is unusable in a corner. I've found it's easier to keep brushes down to a minimum once you've found out what works best for you. I highly recommend beginning with one good size 14 round brush. A synthetic is fine to start - or even to finish! Some artists paint best with a full range of brushes. Some only need one or two good brushes. The fewer brushes you use, the higher quality they need to be. I use a handful of good brushes. Stay away from flats and go toward rounds. Flats have only one stroke possible. Rounds are limitless. Squirrel is awesome for sketching! Holds lots of water and barely skims the surface. It's not great for detail, which makes it a perfect loose, sketching brush. 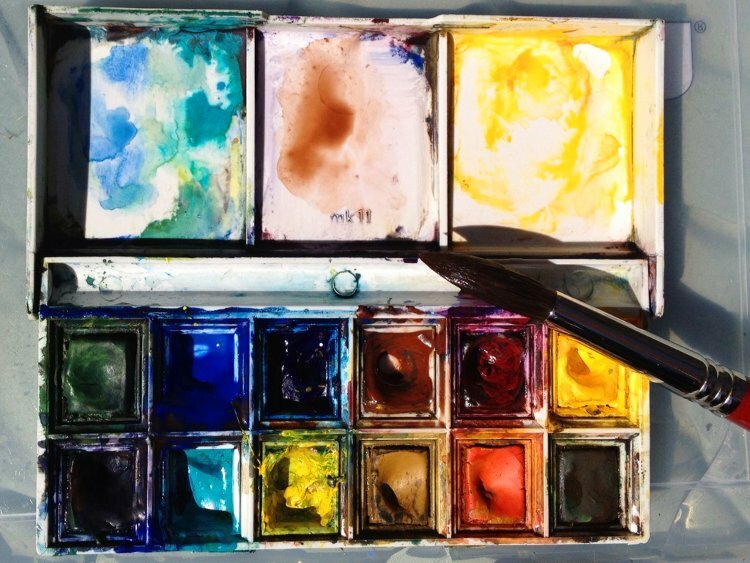 This is the studio watercolor palette I currently use. I use a big wells John Pike palette. Love it! I've recently switched to a Schmincke metal sketching palette. It's perfect for heavy pigment use in sketching. Here's a link to my sketching palette setup. I still highly recommend the Winsor & Newton Cotman Pocket Palette for beginners and beyond. I use cotton washcloths for blotting in the studio and Bounty paper towels plein aire. Paper towels shed and have a harsh texture, but they're really necessary while sketching. Smooth rags don't have enough texture. Don't forget to wash painting washcloths separately - paint stains! Also, don't use detergent or softeners, just hot water. Residue transfers to your paint in awkward places. I always use wax crayons on location. They make it easy to do bold washes and not worry about the little details. Here is my lesson on using wax resist. I use Incredible White Mask. The pencil eraser will destroy paper quickly if you use it on art paper - it's meant for school tests, not art! I use an old Tupperware. It needs to be big enough to not damage your brushes. For in studio, I use one water container and change to clean water constantly. For outside painting, I use 2 containers, one clean, one dirty. The last, but one of the most important things is lighting. Outside, it's constantly changing, so be aware! Sketch fast! Inside, I use several LED lights (mostly custom built by my husband) aimed at opposite directions to reduce shadows. I have blinds I can angle to control natural light. When your painting time is limited, you want to be able to paint early in the morning or the middle of the night. Don't let your lighting let you down! The most important art supply is enjoying painting!